The DUP has once again poured cold water on plans by the Taoiseach to hold an all-island forum on Brexit, saying it wouldn't be taking part. Despite previously being shot down by DUP First Minister Arlene Foster, the idea is back on the agenda with Mr Kenny indicating it is expected to take place in November. Mr Kenny said yesterday that an "all-island, all-Ireland conversation" would take place involving business people, political parties and members of civic society. However, the Irish Independent understands that he has not raised the prospect with Ms Foster since her initial insistence that such a gathering was not necessary. The DUP last night reiterated that position, saying no new structures were needed for cross-border talks, and that it wouldn't be participating. "Responding to proposals by Enda Kenny for an "all-Ireland conversation" on the impact of the European Referendum, the Democratic Unionist Party has indicated its position remains that no new structures were necessary for such discussions and that it would not participate," a DUP statement said. Mr Kenny said it was the Government's intention to protect the Republic's "vital national interest in these Brexit talks". "There is a great deal of confusion out there at the moment and a great deal of uncertainty, not only in Britain but also in Europe," he said. In relation to the Brexit fallout, he said: "I fear that this will run for quite some time. It might not be as straightforward or as short-term as many people think." Mr Kenny added: "We need the conversation as to what is going to happen in terms of agribusiness North-South, meat producers, beef producers, pork producers, industry, financial services, education and health. "All of these are areas that concern us. The primary objective for us as a Republic is to ensure our interests are foremost in our minds in any conversations that we have." 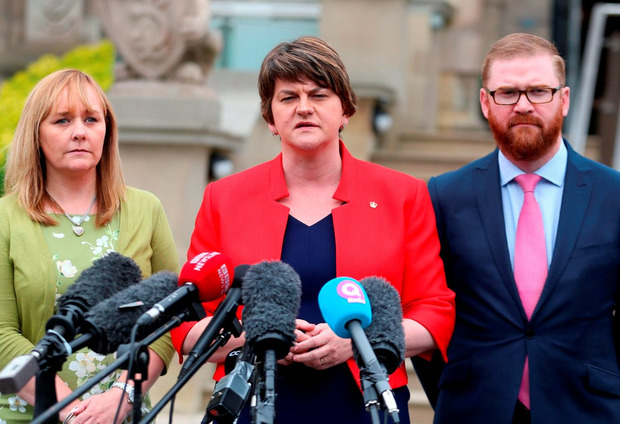 A DUP spokesman said the outcome of the UK referendum undoubtedly has an impact on the Republic and that it is right to have cross-border discussions. But added: "The North South Ministerial Council has already discussed issues of mutual concern and that will undoubtedly continue prior to and during the negotiations between the United Kingdom and the European Union." Mr Kenny was forced to scrap plans for a North-South "all- Ireland forum" to deal with the Brexit fallout for the entire island of Ireland in July after Ms Foster said the issue had not been raised with her. Meanwhile, Northern Ireland Finance Minister Máirtín O Muilleoir told cross-border politicians at an Oireachtas Committee yesterday that around €120m worth of EU funding for cross-border job creation, environmental and health projects are "log-jammed" in the system. He said the funding has been cleared, but has not yet been released. "Those letters of offer are stuck in the system," he said. UK Chancellor Philip Hammond has said that EU funds signed before the Autumn Statement is delivered in November will be funded, even if they continue after Brexit. Separately, the Irish Farmers Association and leading voices within the industry are calling on the Government to implement a series of short-term proposals and interventions in the wake of the Brexit vote to protect the 60 mushroom producers currently operating nationwide. An estimated 90pc of mushrooms, worth €120m, produced in Ireland are exported to the UK - accounting for 75pc of the UK mushroom market.